Fibromyalgia is the name given to a common condition characterized by widespread pain, tenderness and discomfort. Although Fibromyalgia is often considered an arthritic condition, it is not actually a form of arthritis as it does not cause inflammation or damage to the joints. Like arthritis, however, Fibromyalgia can cause a significant amount of pain and fatigue and interfere with a person's ability to carry on daily activities. For unknown reasons, between 80 and 90 percent of those diagnosed with Fibromyalgia are women; however, men and children also can be affected. Most people are diagnosed during middle age, although the symptoms are often present earlier in life. Magnesium supplements typically contain Magnesium in combination with another molecule, this is due to the fact pure Magnesium is a highly reactive substance. Magnesium oxide or Magnesium citrate are both commonly found in supplement form. However, Magnesium Malate may be the best form of Magnesium for treating Fibromyalgia, according to Dr. P. Thomas Riley of the University of Mary, Washington. Magnesium is a popular remedy for fast recovery after exercise and works effectively at relaxing muscles throughout the body. This can offer people suffering from Fibromyalgia a fast, effective way of relieving the pain, but how does it work? Magnesium Malate is a combination of the mineral Magnesium and Malic acid. Malic acid plays an essential role in the metabolism of glucose and the production of energy. It also helps our cells require less oxygen and provide greater stamina and endurance. It is found in abundance in apples and may contribute to the traditional use of apple cider vinegar as a treatment for rheumatism. 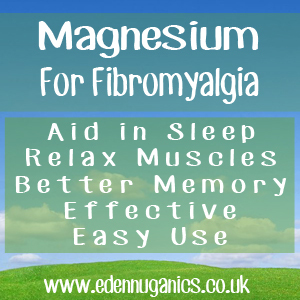 When taking Magnesium Malate for the treatment of Fibromyalgia, a dose of up to 1500mg/day is normal. Another common way to use Magnesium for Fibromyalgia is by adding Magnesium chloride flakes to a warm bath. These dissolve in the water and can be absorbed by your body through transdermal action. This is known to have an extremely relaxing effect on the body. Other natural remedies for Fibromyalgia? Vitamin D - Vitamin D, known as the sunshine vitamin, plays a number of roles in nerve and muscle function. Studies have suggested that low levels of vitamin D may be associated with the chronic pain of Fibromyalgia. Acupuncture - This ancient Chinese medical practice is one of the worlds oldest treatments for chronic pain. There have been a number of studies looking into the usefulness of acupuncture for Fibromyalgia. Capsaicin - Capsaicin comes from pepper plants and is known to be a powerful natural pain killer. In fact, Capsaicin works so well it is used as the main component in many over the counter pain relief sprays and treatments.